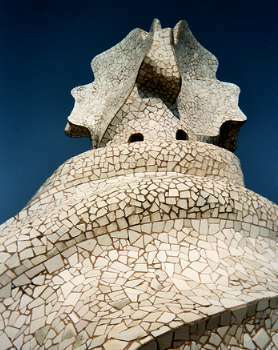 Mosaic art exploded back into life with the work of the Spanish architect/artist Antoni Gaudi. Born in 1852 Gaudi's mosaic encrusted buildings and architectural features overflow with a unique creative identity. The creative use of mosaic has also featured highly in so called 'outsider art'. Perhaps the most famous example is the house of Raymond Isidore, known as 'La Maison Picassiette'. Isidore spent his life covering his home in mosaics which depicted his world and his reams. 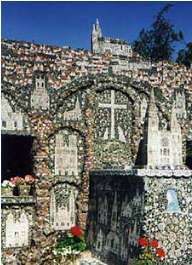 Other examples of this type of use of mosaic can be seen in Nek Chand's garden in Chandigarh, India and The Watts Towers by Sabato Rodia in Los Angeles, USA. Before Gaudi began deconstructing the history and techniques of mosaic art one Antonio Salviati developed and modernised the production of mosaics. From his base in Venice Salviati reached across the industrialised world to provide highly skilled mosaic art still bound in it's heritage and traditions, his work was very popular with the emergent antiquarian tastes of the new Europe. Mosaic's hard wearing nature makes it a naturally architectural medium which has been adopted by many artists including Chagall, Braque, Léger and Miro. In Britain during the early part of the twentieth century the medium was taken up for major decorative works by a number of artists. 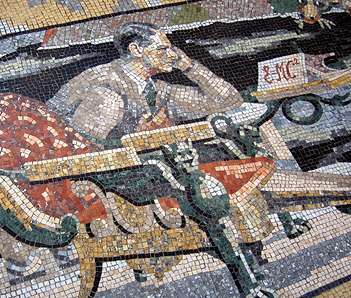 Boris Anrep created mosaics for the Bank of England and the National Gallery. 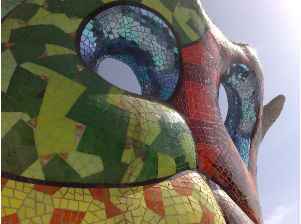 Mosaics organic nature has made it an ideal choice for adding colour to the sculptural form. French born artist Niki de St Phalle created giant dazzling sculptures brought to life with glass, mirror and stone. Today the range of mosaic art being created is amazing, different materials, different styles, different textures and different scales. Mosaic has become the medium of choice for many different voices each expressing their own song, and if this is the beginning of your mosaic journey there is a magical world to discover!